University of Pittsburgh Press, 9780822945291, 320pp. A number of important developments and discoveries across the British Empire's imperial landscape during the nineteenth century invited new questions about human ancestry. The rise of secularism and scientific naturalism; new evidence, such as skeletal and archaeological remains; and European encounters with different people all over the world challenged the existing harmony between science and religion and threatened traditional biblical ideas about special creation and the timeline of human history. Advances in print culture and voyages of exploration also provided researchers with a wealth of material that contributed to their investigations into humanity’s past. Efram Sera-Shriar is lecturer in modern history at Leeds Trinity University, UK. He has published extensively on the history of the human sciences, including his book The Making of British Anthropology, 1813–1871. "In the mid-nineteenth century, new lights—Darwinism, prehistoric archaeology, encounters with the full diversity of the world's peoples—transformed understandings of human origins and development in ways that we are still reckoning with. The stimulating essays in this volume reveal the bewildering mixture of science, religion, racism, universalism, and sheer speculation displayed as new horizons opened up." 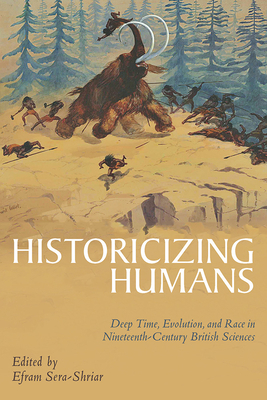 "Historicizing Humans expertly explores how colonial contexts, print culture, and religious commitments influenced scientific theories of human history and race during the nineteenth century. The chapters will be of great interest to historians of the human and natural sciences as well as scholars exploring how ideas and knowledge traveled across Britain’s imperial spaces. A fascinating and valuable volume."